Everyone has a soapbox, whether we want to admit it or not. 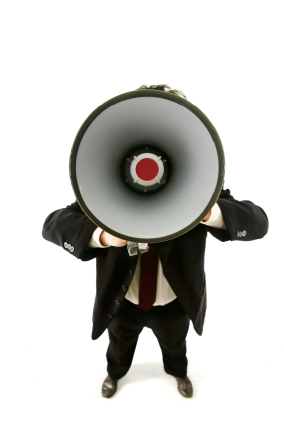 With the rise of technology, most people’s soapbox is through the online world. Take Facebook, for instance. As you scroll through everyone’s status update, count how many of your friends are stating opinions and views on politics, religion, causes, self-promotion, news events, entertainment, etc. It’s there you can see that everyone has a soapbox. What exactly is a soapbox? By definition, it is ” an improvised platform used by a self-appointed, spontaneous, or informal orator; broadly : something that provides an outlet for delivering opinions.” It seems to come from back-in-the-day, when anyone would use a box or other type of platform, turn it over, stand on it and make a speech in the park or the street on a topic that seemed important to them. Today, we may not see much of this, but, as I stated previously, we see it a ton online, especially on social network sites, websites, and blogs. Yet, so many times when we hear the term “soapbox”, we maybe feel a twinge of negativity. But why? Perhaps because of the way the term “soapbox” is generally used. For most of the time, when someone is on their soapbox, it’s as if they can’t shut up about a certain topic. But can a soapbox be a positive thing? Can it be a message that carries an essence that this world needs? In fact, I feel it’s even bigger than that. We all stand for something. We each have an opinion. We all put out a vibe of what we are about. We all have a soapbox that filters to the world about who we are, what our message is, what we believe in, what we live for, etc. 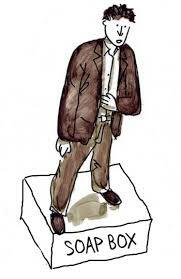 In fact, could we even go so far as to say that we ARE the soapbox itself?? We are the container of whatever message or energy we exude? Could we say that we are the platform? We are the living message – we are the live status update. We are the soapbox. The question to ask is, what is our message? What are we promoting? Let me give you an example. Recently we were in Venice Beach, California, on vacation. This place holds a ton of culture, color, and vibe. As we were walking along the boardwalk with so many other human beings, we came across so much at every corner. The delicious smells of vendors and cafe’s filled the air with scrumptious aromas. The breeze carried the rise and fall of tunes from street musicians sharing their gift with bypassers. Although crowded, the air was alive with the eclectic mix of humanity, summer, the beach, and southern-California life. As we rounded one corner, the air changed. You could feel the tension in the atmosphere. As we got closer, I could recognize the tone and voice inflection of someone preaching through a bullhorn. I couldn’t understand at first the words this person was saying, but I could tell by the rise and fall of his voice, that he was speaking about hell and “warning” all of us of “God’s wrath.” As we got closer, I felt the tension as well. I felt embarrassed, disgusted, and pitiful for this man. He wasn’t even looking anyone in the eyes. It was as if, at his core, he knew that this maybe wasn’t the best tactic. He was reading from a Bible, specifically from Romans 1, out-of-context, referring to all the things that are wrong with humanity. There were other people around him, somewhat mocking him and holding up signs that had been quickly scribbled on cardboard, stating things like “Satan loves you”. Not that they believed that, but it was their way of dealing with the tension of the situation. The energy felt oppressive and dark. But not from the mocking signs. It felt “off” because this man had chosen as his soapbox this outlet, this message, this place. He probably felt like he was a modern-day prophet, warning people of “the wrath to come.” But he assumed a lot about all of us, and instead of getting to know who we all were, with our stories and experiences, he instead used his soapbox of religious fear to try to get people to turn to his God. But it was all wrong. He couldn’t even look his fellow human beings in the face. As we walked by, and his voice disappeared from our earshot, the energy once again changed back to the beach, the summer afternoon, and the wind in the palms. Later that day, we decided to rent bikes. We rode all the way past Santa Monica pier, and towards Malibu. The afternoon was waning, and the sun began it’s preparation to set. We turned our bikes around to head back towards our hotel. The air hung with a peaceful stillness as we sailed along the bike path that snaked it’s way along the seashore. Suddenly, a man joined us on the path, roller-skating. 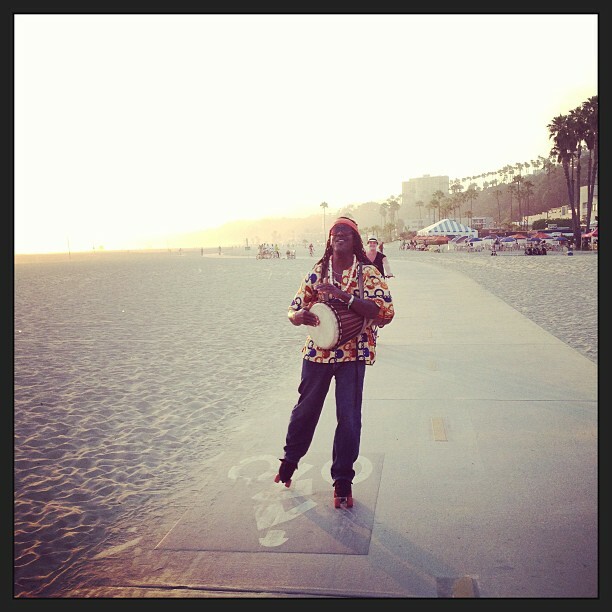 He held a drum in his hands and skated in rhythm to the beat he played on his drum. There we were, the sun sinking behind the Malibu hills, the sea crashing beside us, and the wind in our hair. His beat was almost a pulse of the earth – a pulse of our beating hearts. Then he began to sing. His song was simple, really. He made it up as he sailed along the shore. He sang a love song. Not sure who it was to. But it felt like it was to all of us. It felt like it was to the sea, the sun, the day. To all of humanity. He kept saying, in beat to the rhythm of his drum and in sink to his roller-skate-step, “I love you baby…Cuz I need you in my life…I just want you to know…That I love you baby…” With the gulls soaring above us, and the day dissipating into evening, it felt like we were being carried by his song. I literally felt like God was singing to me. I slowed my pedal and rode behind him, for miles. A soapbox of love being carried on roller-skates. It was so cool to see the expressions on people’s faces as we neared different crowds along the path. It was amazing to see them first catch the sound of the beat, to hear his song on the wind. Startled, many of them would look around to see where it was coming from. Many of the crowds were packing up and heading to their parked cars. Some looked tired and exhausted from the long day in the sun. Some families were even bickering. But then they all stopped as they heard the song on the wind. As the roller-skates inched closer, and the song become louder, it was amazing to watch their faces change. They became filled with wonder, peace, and respect. It was if they became children again. It was as if they were all thinking “that’s so cool – I wish I was free enough to do that.” It didn’t matter who saw him – all different ethnicities, all different ages, genders, and walks of life. Everyone had that look on their face – the look of admiration, tranquility and a yearning for more. It was as if they were reminded of the magic of life – the beauty of a simple day at the beach – the wonder of togetherness. It was beautiful. The time came that we had to reluctantly pass him to get to our destination. We asked if we could get his picture, and he nodded, in mid-beat, with a smile on his face. He looked us in the eyes, and shared a nod of commonality. As we went our way, his song slowly melted away into the twilight air. But the beautiful energy of that encounter stayed, as if the heartbeat of the universe carried us along on our separate journeys. We all have a soapbox. We all carry a message. In essence, we are a soapbox to this world. The question to ask is, what is your message? Is it one of fear, judgment, and division? That’s one mindset – one soapbox. Or is it one of love, peace, and a nod of human respect, even a celebration within our diversity? Because whatever message we choose to emanate, that will be the pulse which carries darkness or light to this world. The choice is ours. We all have a soapbox. We all carry an energy.